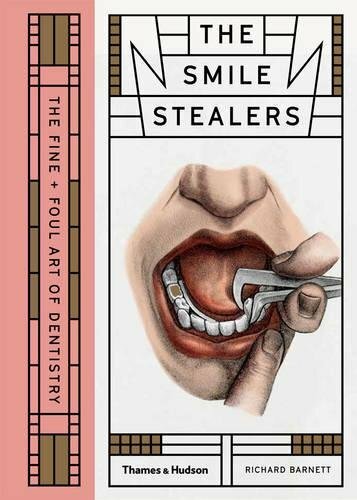 Marking the third and final volume of the best-selling and award-winning series that began with The Sick Rose and Crucial Interventions, The Smile Stealers traces the story of dentistry from the excruciating endeavours of early practitioners to the swift (but not always painless) procedures and cosmetic dentistry of today. Gruesome yet captivating historical images of techniques and tools are presented alongside caricatures, paintings and the rarest of books and artifacts from the Wellcome Library’s unique collection. Eloquent and engaging essays trace the emergence of the trade and discipline of the dentist, from craftsman and charlatan to skilled professional, illustrating the changing social and cultural attitudes towards the purpose and practice of dentistry, from the extraction of rotting molars to the pursuit of the perfect smile. I’m curatorial consultant to ‘Teeth’, a forthcoming Wellcome Collection exhibition inspired by The Smile Stealers, which opens on 17 May and runs until 6 Sept. The Smile Stealers was published on 27 April. You can read more about it on the Thames & Hudson website, and order a copy on Amazon. The Smile Stealers is published in the US by Thames & Hudson USA, and in Italy by Logos Edizioni. Kate Wands at Thames & Hudson handles press & publicity enquiries: k [dot] wands [at] thameshudson [dot] co [dot] uk. The Guardian published a gallery of images from the book. Matthew Sweet interviewed me about The Smile Stealers on BBC Radio 3’s Free Thinking, Terry Gross interviewed me for NPR’s ‘Fresh Air’, and I spoke about it on Monocle Radio.